2 Media Slots- SD/MMC + Micro SD. Support SDXC up to 2TB, SDHC, SD, MMC, RS-MMC, Micro SDXC, Micro SD, Micro SDHC Card, and UHS-I Cards. Build-in Card Cover Design: It allow you store the cards inside the memory card reader, and don’t need to worry about losing the cards. Plug and play; Hot swapping; USB power (no external power or battery); Supper speed USB 3.0 and backward compatible with 2.0/1.1. Auto detect memory card; Support SDXC up to 2TB, SD V3.0, UHS-I standard, latest Micro SDXC and MMC 4.4. Micro USB Adapter + USB Card Reader/LED status indicator keep on when connected, flashing when transfering data. Free lifetime technical support and 24-month manufacturer’s warranty. Rocketek® RT-CR3A 11 in 1 SuperSpeed USB 3.0 Card Reader base on Easy portability design, with a build-in Card Cover, it is able to store the cards inside the memory card reader, and don’t need to worry about losing the cards. It allows you to easily add a USB 3.0 multi-slot card reader/writer to your USB 3.0 enabled system. 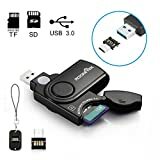 The Rocketek USB 3.0 SD / Micro SD Card Reader is a great option for anyone looking for an easy way add support for the most common storage media types used in common digital cameras, MP3 players, and mobile phones,etc. Packing list:mini pc,Power adapter,bracket,screw,package box. Looking to add Gigabit Ethernet speed to your USB3 port on a notebook or desktop computer. The newly released USB3-CAB-RJ45G is a high-performance, gigabit Ethernet (1000/100/10Mbps) adapter that simply connects to your existing SuperSpeed USB3.0 port found on most recent Windows and Mac OS X compatible desktop and laptops. Levering the true power of gigabit Ethernet including support for full-size, jumbo packet sizes, large buffer memory and of course full-duplex power to give up to 2000Mbps transfer rates. Ideal for business and private users alike, the USB3-CAB-RJ45G allows superfast IP data transfer, so its idea for almost all applications, from online movie streaming, database access or even a more fluid gaming experience. Ideal for Windows, Mac OSX and is fully Plug nÆ Play with desktops, servers, MacBook’s and even compatible TV boxes and Media Centres.